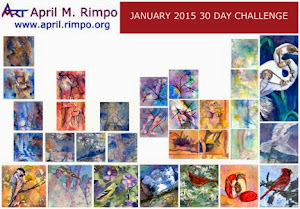 Frequently art challenges are organized that encourage artists to create a painting a day. Normally my paintings take much longer than this, but the point is to get 2015 started with a flurry of new work. I decided I'd experiment with some new ideas so by the end of the month I could decided if I wanted to explore it more in more complex work. This challenge was organized by Leslie Saeta. 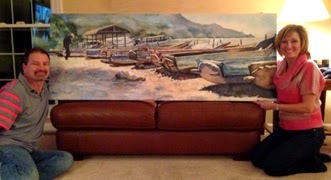 I'll include a link to her blog where you can see the paintings of all the artists who are participating. I received an email from Leslie this morning and apparently there are 810 people participating in the challenge. I have done a lot of research and worked out the color schemes for my work and prepared 8" X 8" gallery wrapped paper "canvases" so I am ready to go on January 1st. You can see some of the color scheme in the swatches I assembled in the photograph at right. I'm not going to share the concept but will tell you that as you follow along there might be some surprises along the way. I hope you enjoy the journey that begins tomorrow. Since night scenes are not something I’ve done a lot of, I wanted to be sure to capture the colors I used in Lit by the Moon. Indigo blue – which is a Da Vinci watercolor pigment - and Coral, which is a Daniel Smith watercolor paint. Both I mixed with Golden “Fluid Matte Medium” to make my own fluid acrylic. Daniel Smith Coral is my go to color these days. It makes wonderful shades of lavender when mixed with just about any blue. When mixed with blue and yellow, you get great grays. 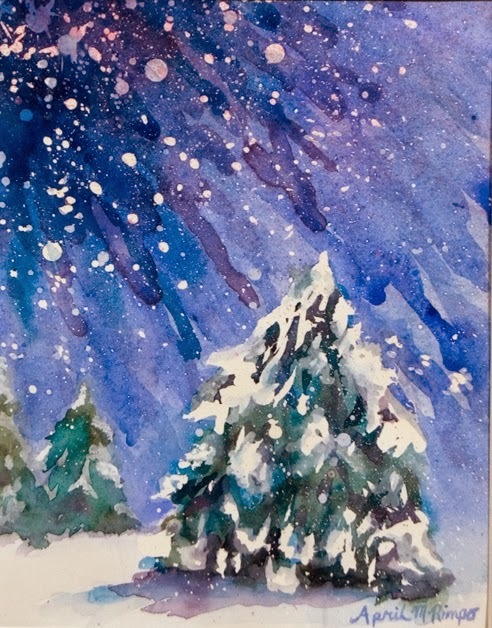 I started with masking fluid “sprayed” on the white paper, which becomes the falling snow. After an initial pale wash I added tiny wisps of tree branches and bits of snow that had stuck to the yet to be painted trees. I also added some masking fluid where I wanted the lit side of evergreens and bushes in the foreground. And let’s not forget the moon was added in mask at this point so the yellow glow is retained. I left some openings in the mask on the moon to allow darker hues to create the craters on the moon. Some kosher salt was applied to the bushes in the front in hopes of adding some texture to the snow as a foreground detail. I say "in hopes" because normally I test pigments with salt to be sure the desired granulation will occur, but the salt was a quick decision and timing the addition of salt is critical. A second medium intensity wash was added to further vary the colors across the painting and to begin to make darker areas in the sky. I left some of the yellow shining through, especially around the moon since I wanted the moon to glow. When dry this layer was followed by more masking of branches to give the illusion that different branched catch different amounts of the moon light. I added a small amount of dark on top of the dry salt in the foreground bushes to add some variety. I actually had forgotten to remove the salt and knew I likely lost any subtle granulation in the snow. These things happen. Darker combinations of the blues were added in the third layer. This is also where I used the pale mixture of white and yellow to retain some lighter cloud areas here in there behind the trees. There is a church steeple in the distance and I used some of the light yellow mix around the steeple so it wouldn’t be totally lost. The steeple was inspired by St Paul’s Church and has the characteristic lighter stripes used to accent the architecture on the steeple, but I intentionally muted these at a later stage so the painting is about the falling snow and the steeple is there for those who really examine the painting in detail. The trees were adding in dark and medium dark hues while most of the masking was still in place so the limbs catching the light were preserved. At the end the mask was removed and just a few spots required a dab of darker paint here and there to integrate the branches. I've always found snow scenes intimidating, but decided to rise to the challenge this year and give it a try. 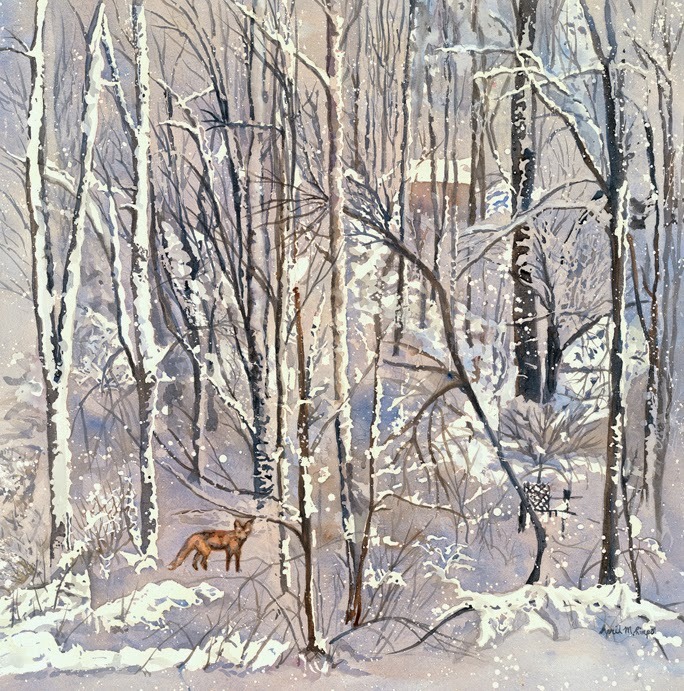 A fresh snow gives me a sense of calm, provided it is not so deep that I have to go out and shovel it for hours. I thought back to all the lovely colors I'd been using this year and selected some that I thought had a calming effect on me and thought about which ones would be a good way to capture the light. Much of painting snow is really capturing the light since the snow is "white" and is a perfect surface to allow you to see it. Currently we have no snow on the ground so I went back through photographs I have taken the morning after a snow fall and really concentrated on the colors in the snow. And there they were pale yellows, lavenders, and warm blues. About a week after completing this painting I was fortunate to attend a talk by Lee Boyton, who studied painting the light with Henry Hensche at the Cape School of Art in Provincetown, MA. According the Lee's bio "Henry opened Lee's eyes to the poetry of using color to capture the subtle and ever-changing effects of light." During Lee's demonstration I found out that what I had stumbled upon in this painting was part of the philosophy of the American Impressionists and what was taught at the Cape School of Art. I think the concept Lee portrayed in his demonstration is one I am innately drawn to and will definitely pursue this more in my work. 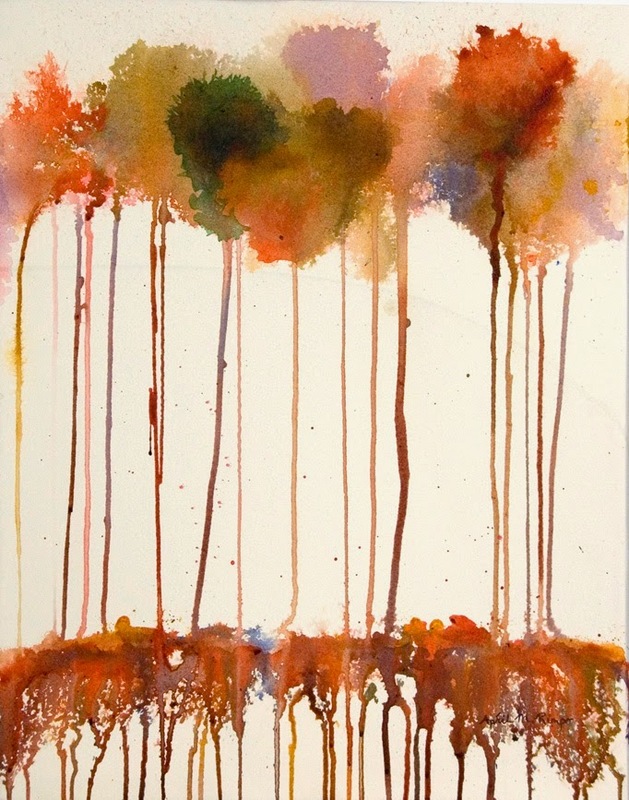 See some of Lee Boynton's work and read more about this school of thought on his website. I recently joined Pinterest. As part of setting up my boards I spent some time looking at art by others and realized a lot of the art I liked most was either abstract or semi-abstract. The layers of color and textures in these pieces spoke to me. 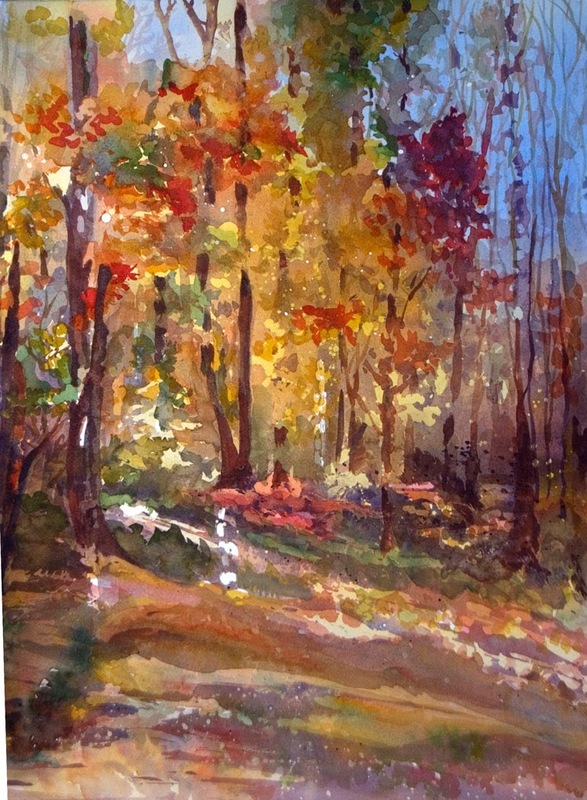 I have always loved texture and use a variety of techniques to add texture to my watercolor and fluid acrylic paintings, but the pieces I saw by others had achieved so much more by including layers of opaque as well as transparent colors. I had the beginnings of this painting sitting in my closet for about five years. All I had completed was a wash of three fluid acrylic colors applied at full strength. I set the painting aside because didn't know where to head next. This week it finally clicked. I decided to use the original wash as a base for the steep cliffs. The first thing I did was wet the paper and add a pale wash of transparent colors over the painting allowing the paint to drip toward the bottom. This created the soft glow of the sky and added some very subtle colors and texture to the the cliffs. Once dry I added some white and yellow opaque colors randomly over the cliffs, allowing them to drip from various heights of the cliffs. After dry I repeated the process but added some pale tints to the white to add more texture and color over the base. I used pale blue and coral washes along the edges which added some gray and lavender tints along the edges helping to keep my eye inside the painting. I knew from the start that I wanted to add some abstracted trees to the tops of the cliffs. When I started to add them I realized they needed to be quite small to help strengthen the height of the cliffs. I started by adding a few trunks and branches in masking fluid, adding color, added more mask branches, more color, repeating these steps as I added darker colors. Once I removed the mask I just had to add a couple lines here and there to finish the trees, but very little editing was needed. 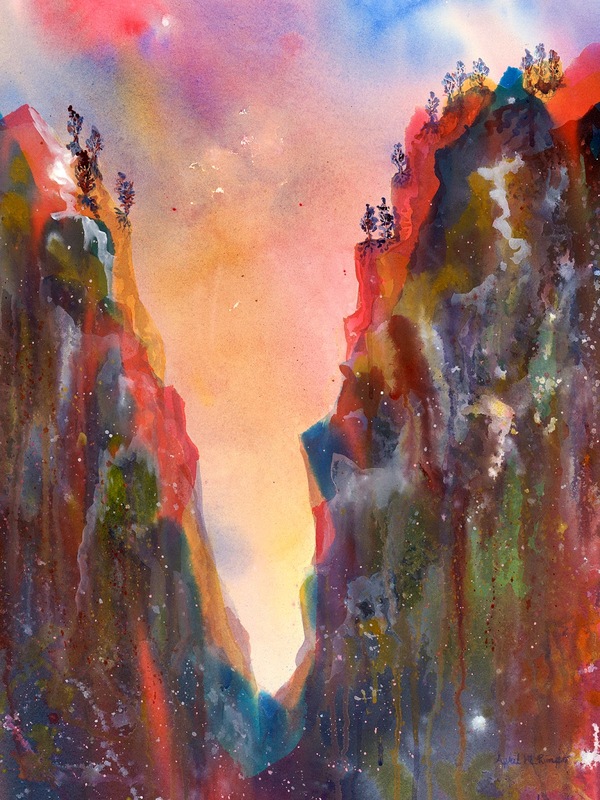 I like the illusion of height and the textures of the cliffs in this semi-abstract painting. What do you think about the result? Do you see where this approach might solve problems in paintings you are stuck on? I'd love to hear from you. 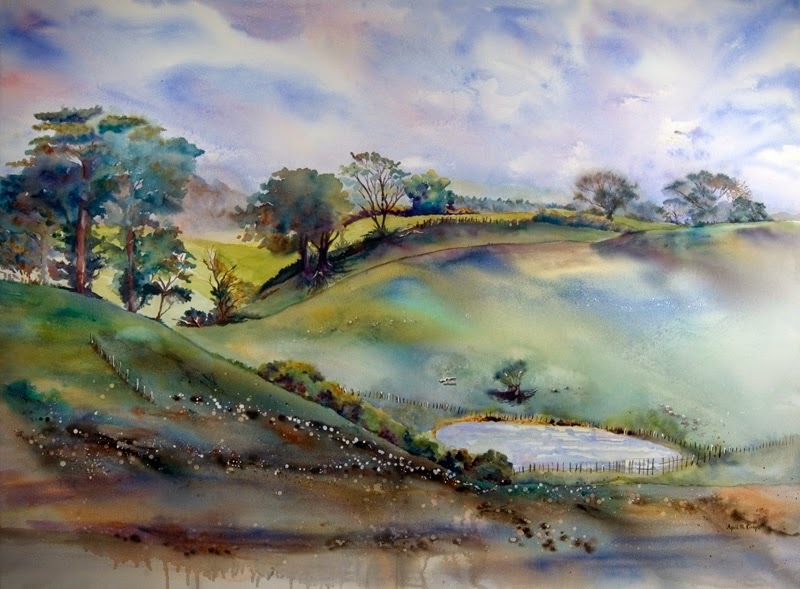 Rolling Hills 44" X 58"
Heal the stress of everyday life. Boy did I ever need that before I switched my career to full time artist. Stress was the definition of my days. Even though I am no longer in the high stress world the services at Haven on the Lake sound enticing. Check out their website to learn more. The spa opens on December 6th for all Wellness Spa Services and on December 15th for Mind Body Movement classes. Standing Tall 20" X 16"
This new spa has art by area artists on display and for sale. I was one of the artists selected to have three of my paintings on exhibit. There are about sixty paintings on display for the next six months, then new art will be selected and displayed. 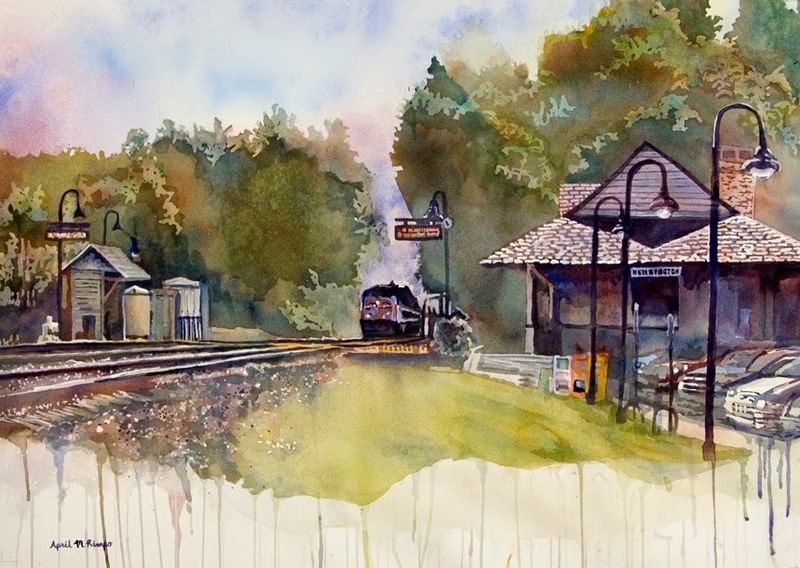 A few other artists who also have artwork included at the spa are: Nancy Lee Davis, Diane Dunn, Debbie Hoeper, Deborah Maklowski, Pat Roberie, Cathy Sawdey, John Stier, Kathleen Stumpfel and Barbara Steinacker. I, for one, am anxious to see the spa and all the art. 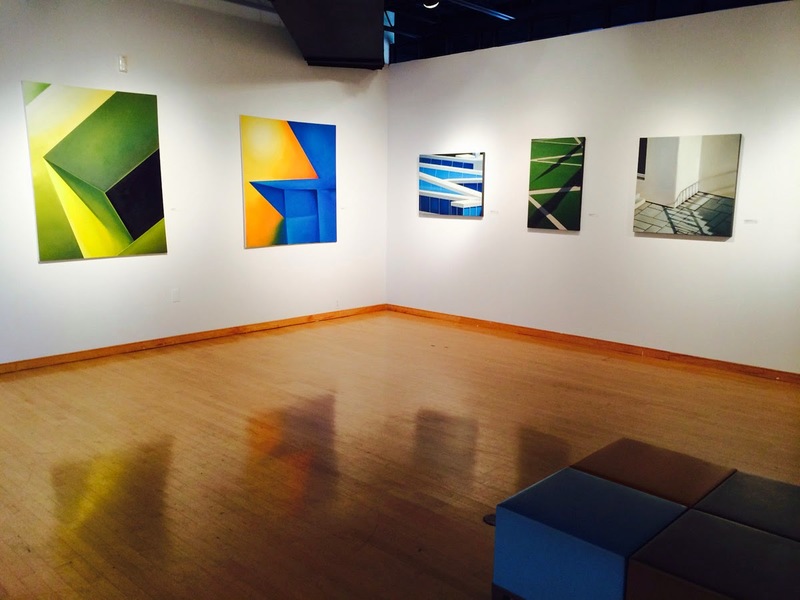 The artwork changes periodically, so stop by Haven to see what is currently on exhibit. 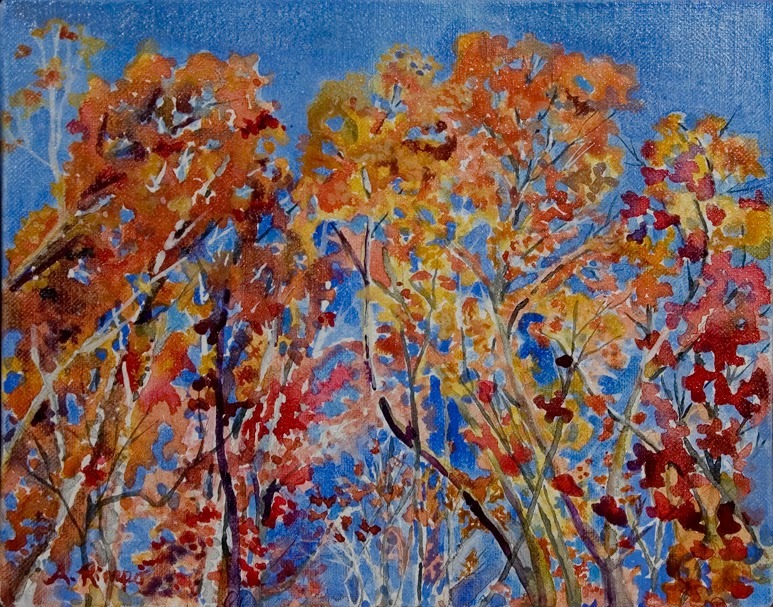 The leaves have fallen but I keep painting them because I hate to admit they are gone. This year we had pretty good color in the trees here in Maryland. You would think that by now I would have figured out the pattern of when we will have good color in the trees and when they will just turn brown and fall quickly. But no matter how I try to second guess what will happen, I never guess correctly. Now my husband and I believe we do know when there will be a good crop of acorns in the trees; dry years seem to have a large yield and wet years very few acorns. But the color of the leaves? Not so much luck. I have a feeling it is a mixture of rainfall, temperature, and a few other variables that just allude us. Being an artist I can just pretend every year is a great year for color and create paintings that celebrate the glory of the leaves. If you know the answer to the puzzle of Fall's color, please do share. I've been painting a number of large paintings recently. The largest was 44" X 58" , another was 24" X 72", and several were 24" X 34", So when I rediscovered these 3" X 3" canvases I decided to do a few miniatures. Some of these miniatures were derivative of other paintings I've done this year. It was fun to figure out how to simplify these earlier paintings so they would work in this small format. My favorite is the Ferry Boat since it was a subject I've planned to do for a while. I'm so happy with the result I now want to do it larger, but no doubt there will be several other paintings before I actually do the larger version. Fire House II and B and Caboose has sold. 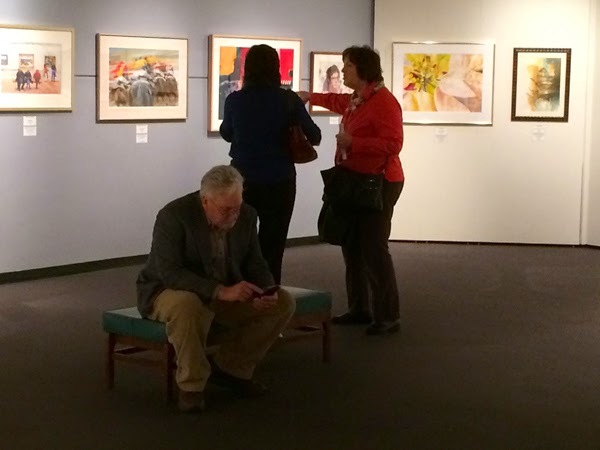 Here are a few pictures from the Pennsylvania Watercolor Society's 35th Anniversary International Juried Exhibition. The Pennsylvania State Museum is quite a beautiful venue, as you can see above. The crowd was great, but it is hard to get good pictures when they are all looking at the paintings, so while awards were being presented I ran back to snap some while the view is open. I've also included a short video of the paintings that were in the same alcove as my painting, ending with an image of mine, Student Brushes. From this small clip you can get a sense for the great variety of art in this exhibit. So enjoy this glimpse of the exhibit and go see it if you can. 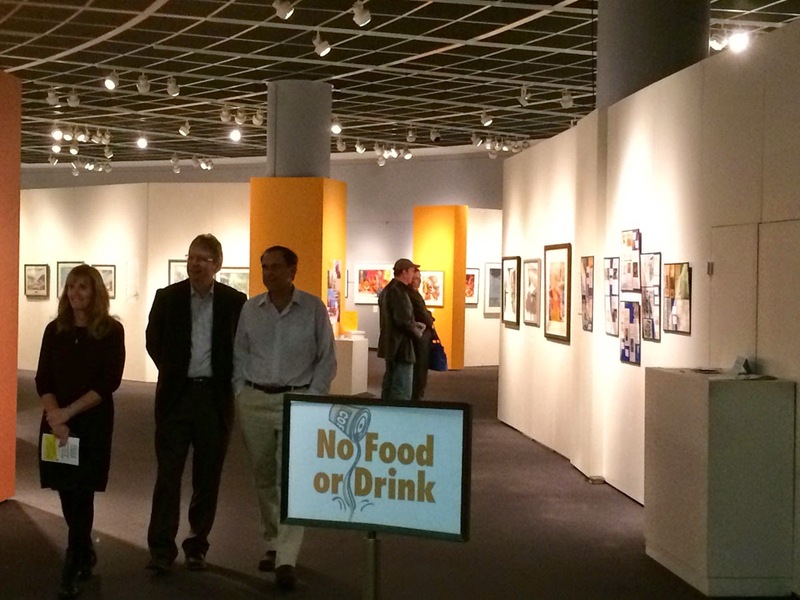 The exhibit runs through February 8, 2015. 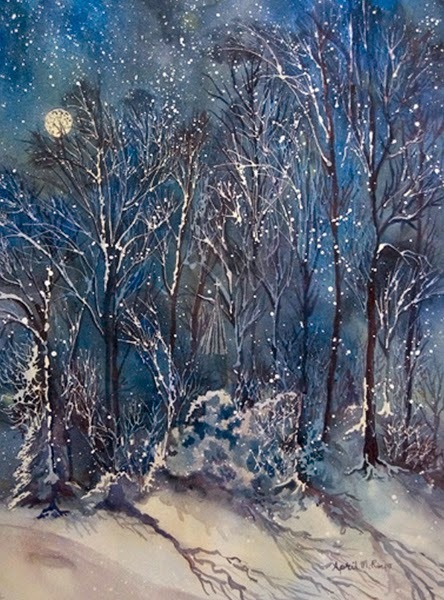 We had our first snow flurry this week and I felt it was time for a painting of snow. For the last week I've been busy painting miniature paintings in preparation for holiday sales events and for this Small Wonders exhibition. 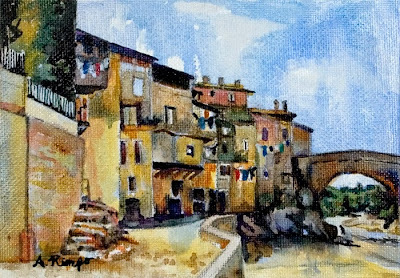 Laundry Day at Vaison La Romaine is my donation to the Small Wonders exhibit to be held at The Rouse Company Foundation Gallery at Howard Community College. 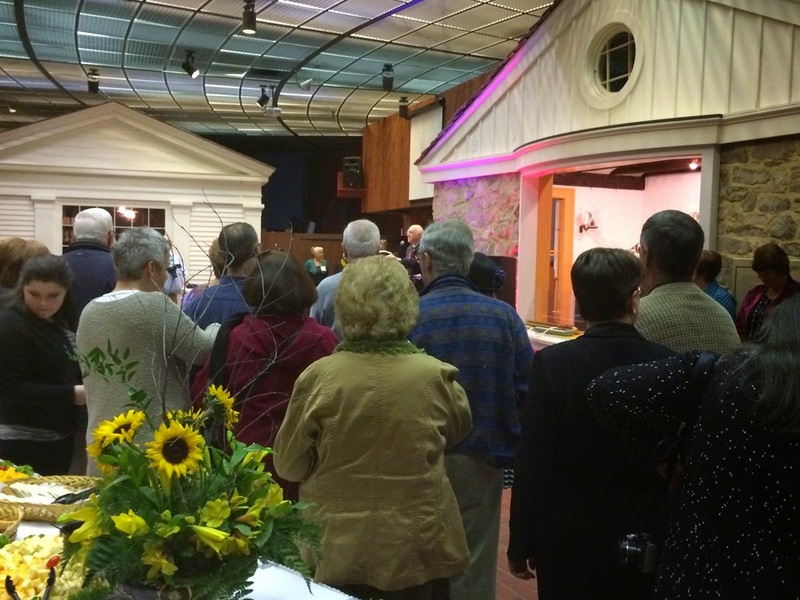 A gala reception will be held on November 20th from 5 - 8 pm. Proceeds from the sales will benefit the Howard County Food Bank and a fund to purchase outdoor sculpture to beautify the Howard Community College campus and share with the community. 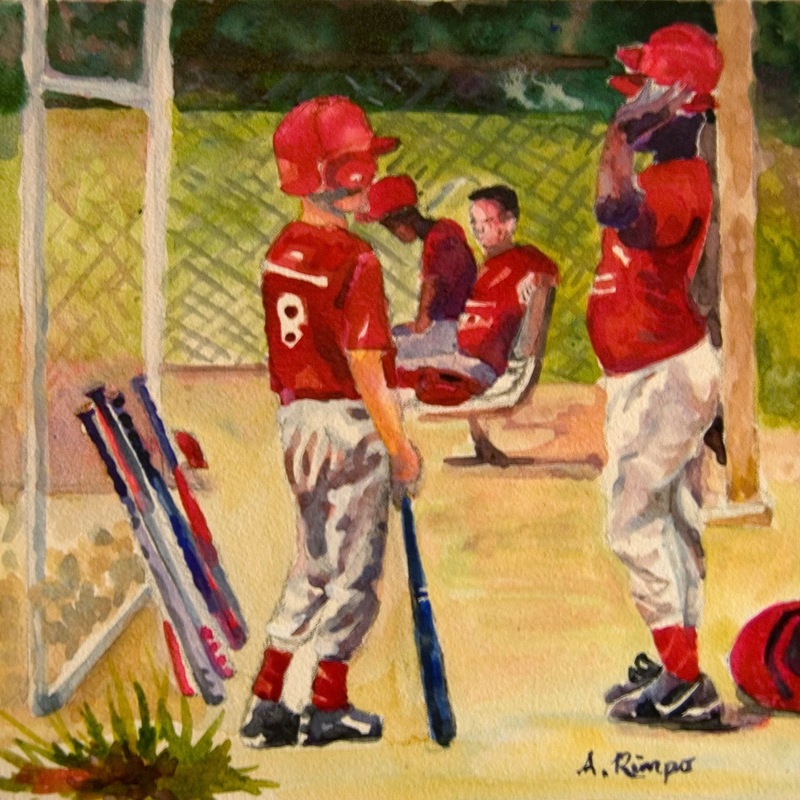 Please consider attending the gala and purchasing one of the small works. I decided to send out my thanks half way between the Canadian and USA's celebrations of Thanksgiving. There is something about the coming of fall that makes me more introspective. Perhaps it is the changing of leaves to their autumn shades that makes me more aware of time flying by. So here are my thanks for 2014. My newest item to be thankful for is the Featured Artist promotion by Artsy Shark. This is a very popular blog with over 4000 followers. They share great tips for art as a business, but also feature a couple artists each week. I enjoy visiting the sites of other artists since the variety of art is endless. Please enjoy my feature and take the time to visit my website. Special thanks go to the many art organizations that make it possible for me to show my work to such a broad audience. Starting at the home front, I'd like to thank the Howard County Arts Council for curating such a beautiful exhibit, Building Perspective, that included my art and that of four other artists. Samples of the art are shown here. The care and skill that clearly went into this exhibit was obvious as soon as you stepped into the gallery. The mages are included to give you some sense of this show. HCAC also sponsors Celebration of the Arts in Howard County where both visual and performing artists from the region are featured. I always include at least one piece of art in the Art Auction that is part of this celebration. Proceeds from the auction are shared by the artist and HCAC. It is so great to have two organizations here in Howard County Maryland who work hard to promote artists in the community. 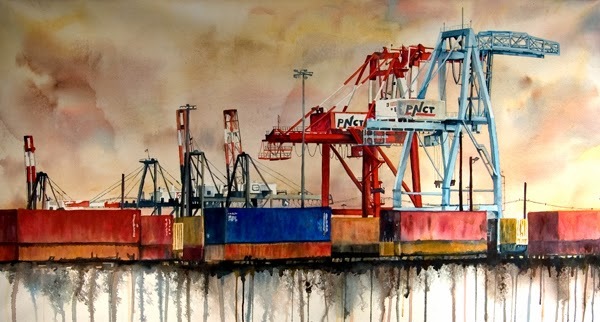 The Maryland Federation of Art, based in Annapolis Maryland, offers a variety of exhibitions that are open to artists in the United States, Canada, and Mexico. I am thankful to have my art selected for inclusion in three of these exhibitions. 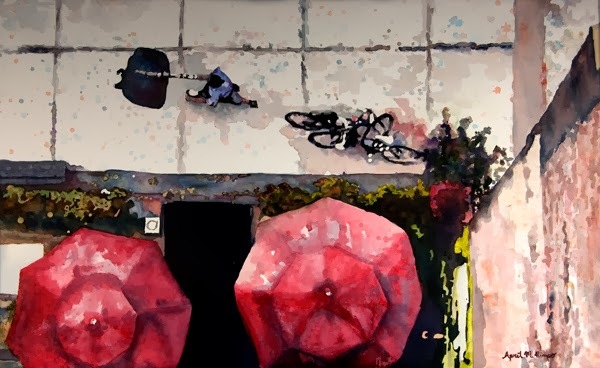 The MFA also promotes exhibitions at other venues in the region and my paintings were included in two of these: Gallery B in Bethesda (Aerial Bike I) and MDArt at College Park at the University of Maryland (Freight Yard & Bike Rider). The MFA is very creative in their support of Maryland artists. My way to give back is to donate a painting to their annual Collector's Choice Art Raffle, where attendees get to meet the artist, enjoy great food, and go home with a piece of art. 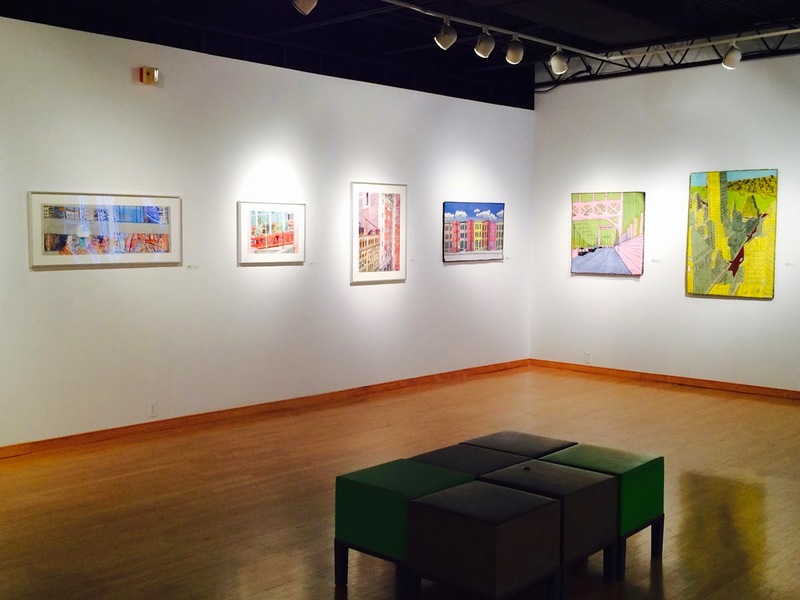 Local art organizations also provide venues for regional exhibitions. 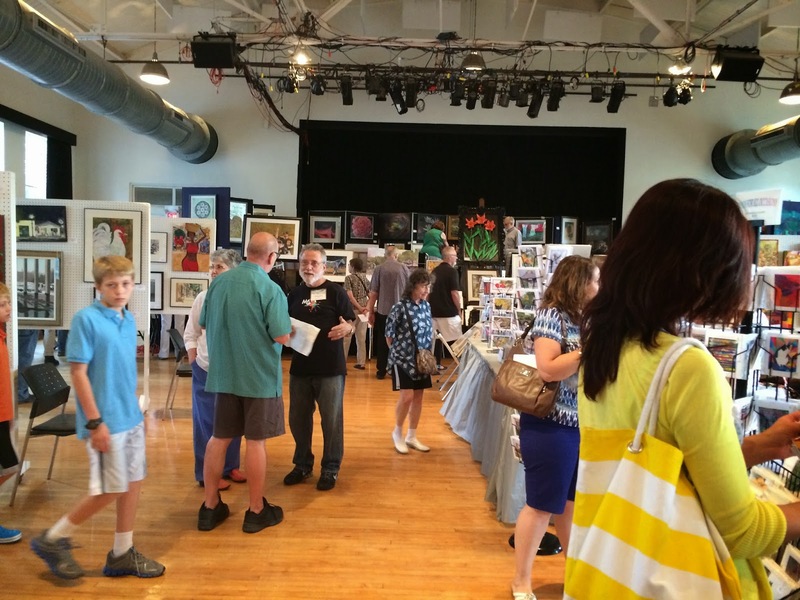 I extend my thanks to Laurel Art Guild, which held their 45th Annual Juried Exhibition this year. My painting, Woman with a Wrapped Hat, received the First Place award. 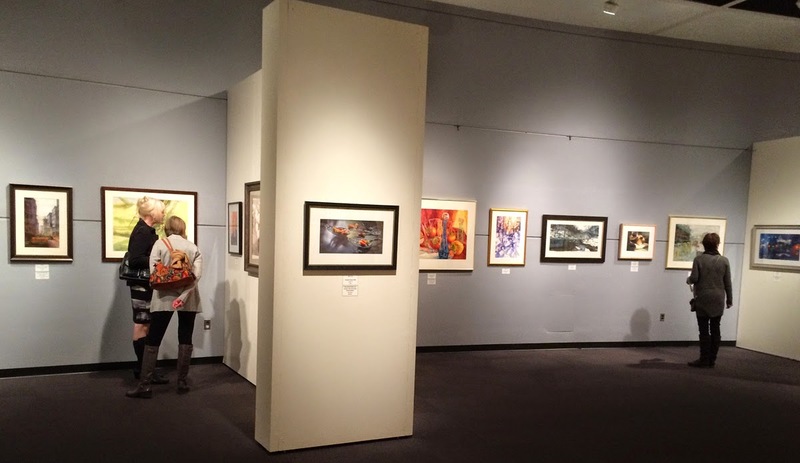 In addition, the Artists' Gallery of Columbia held their annual Local Color exhibit in which they invite non-members to exhibit. They receive paintings, select the pieces to be included and to receive awards, and the show is on display within a couple days. This was my first time in this exhibit and my painting, Messengers, received a Second Place award. Another new venue for me was the Kensington Labor Day Weekend show in Kensington, MD. 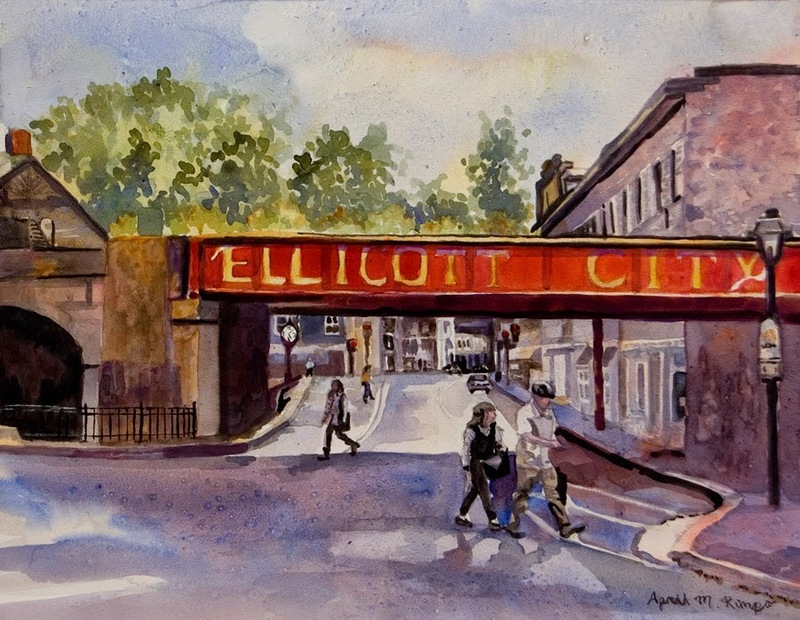 Each artist must include at least one painting of Kensington in this show. This event is run by the Montgomery Art Association (MAA.) This exhibit is another major feat in organization and volunteering. The Labor Day Weekend Show set records both for the number of paintings submitted, 550, and the number of artists participating, 130, of which 79 of these artists had sales. Imagine receiving 550 paintings and getting them hung in one day. Many kudos to the MAA. 2100 people attended the show over Labor Day weekend. 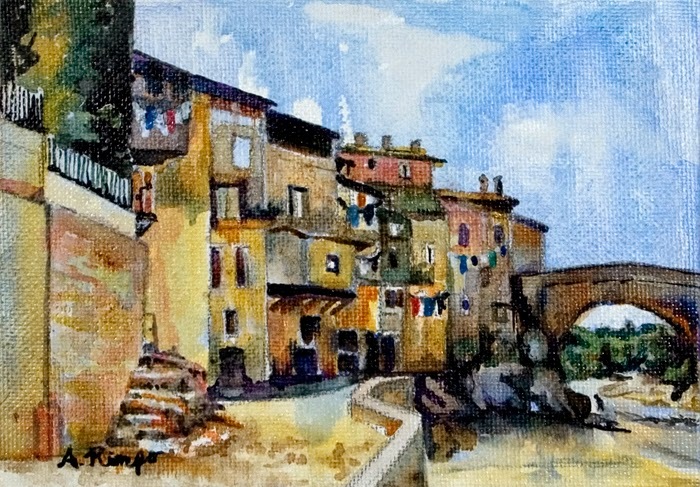 My painting, Ponte Vecchio, received the First Place award in the Landscape category. 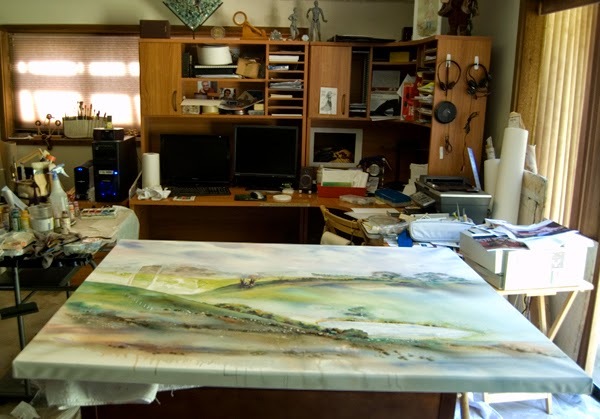 In addition to the local organizations, there are watermedia organizations across the country that hold annual National or International juried exhibition. I've been fortunate to have my work selected in the following exhibits. 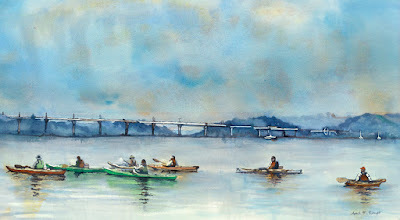 Since I am on the board of the Baltimore Watercolor Society, which holds a Regional Exhibition of the same caliber as these each year, I am aware of the enormous amount of work it takes to hold these exhibitions and my thanks go out to all these organizations for offering these opportunities. I am delighted and thankful that I was accepted into just over 50% of the exhibits I applied to this year. This year I took some time to locate some galleries to carry my art; I added two. Still Life Gallery in Ellicott City, Maryland - sold my first painting in their gallery in less than 24 hours. It is so great having a gallery represent my work, providing a new path to reach my audience. Open Wed - Sun 11 am - 6 pm. 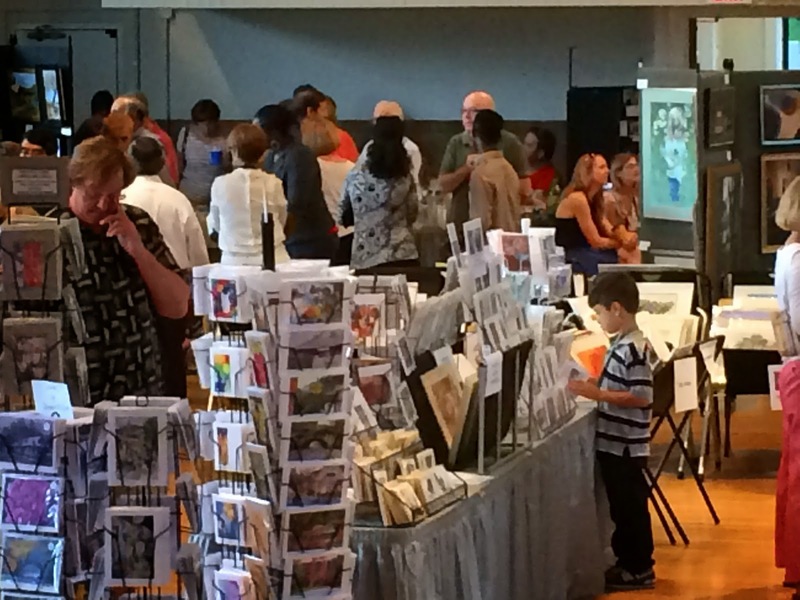 Montgomery Art Association Gallery in Westfield Wheaton Mall in Wheaton, Maryland - A cooperative gallery where the artists run and operate the gallery from Mon - Sat: 11 am - 8 pm, and Sun: 11 am - 7 pm. 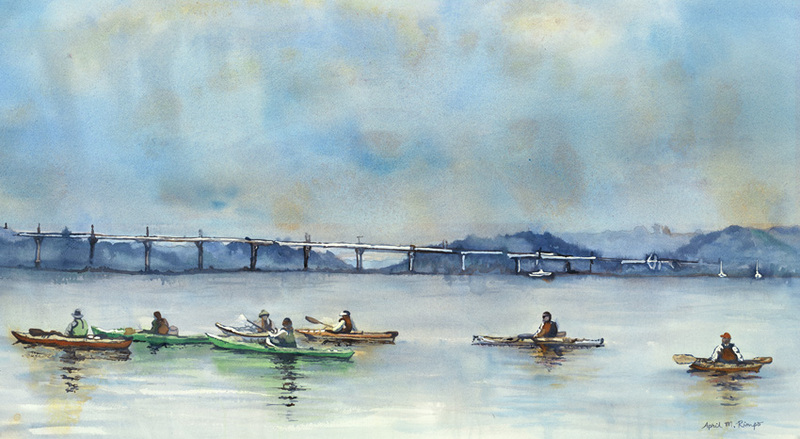 Consider stopping by the gallery, where you can purchase original art, prints, and cards by local artists. I continue to include my art in Xanadu Gallery's Online Studio - a wonderful venue where Xanadu Gallery includes artists from around the globe to help us promote our art. Jason Horejs is a very innovative gallery owner who provides many webinars to help artists with the business side of art and hosts the ever informative Red Dot Blog. Huge thanks go to the people who have acquired either my original paintings or prints. My customers have been a joy to work with. I have never held a job that included as much time working with the public and am happy to report that my experiences have been really positive. Some of my customers are old friends while others I met through my art. It has been a joy to meet such nice people who are now caring for my art in their homes. Some have also helped me learn more about selling prints that were enlarged from the size of my original paintings. These were printed on canvas and varnished to protect them from the elements. It was fun to see my work in a larger format. I loved how some of the techniques I use in my watercolors look even better when enlarged. Thanks to these customers who helped me grow my business acumen and to Archival Arts for the excellent quality of their prints and the great advise they provide. And last, but certainly not least, I am grateful for the support of family and friends who provide such great feedback and encouragement for my art and my second career as a full time artist. When I decided, nearly three years ago, to start out on this venture as a full time artist I knew it would be an upward climb to get known by the art community and to begin to sell my art to the public. I've learned a lot over the last 3 years, made some mistakes, but also made some great strides as well. My family and friends have provided the moral support that kept me going. My husband, Chas, is an amazing person who has picked up the slack around the house, as I spend much of my day in the studio, out shipping or delivering art, working on the computer writing blogs, updating my website, posting in Facebook and Pinning images in Pinterest. Chas encourages me in so many different ways. Thank you, Honey.